“Shadows Under Hexmouth Street” is my Joe Mitchell in Lankhmar story (mixed in with bits from my late aughties day job at an architectural preservation company). 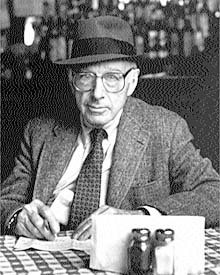 Joe Mitchell was a 1940s New Yorker writer. That’s him over there on the left. He specialized in urban pieces about kooks and weirdos. Lankhmar’s a massive fantasy city created by Fritz Leiber. 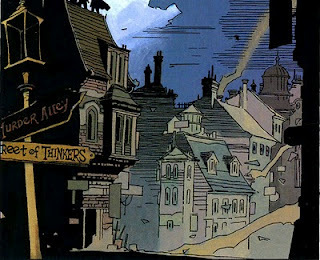 That’s it in the middle as drawn by Mike Mignola, the Hellboy guy. 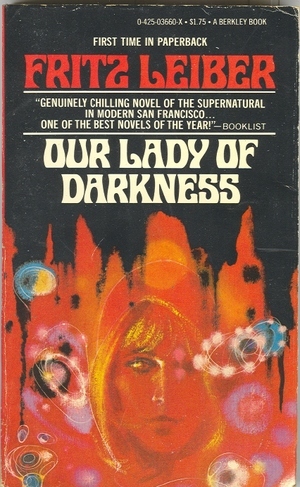 In the early 1970s Leiber published Our Lady of Darkness, there on the right. It wasn’t set in Lankhmar, but it featured a magic system called polisomancy. Polisomancy’s all about capturing urban elementals born from construction materials and was practiced by kooks and weirdos in cities. You can read it or listen to it here.